Another go at a moon scene, need to work a little more on the lighting so it lights more of the terrains. To make it really sit into your scene you really need a blank sky though. It's too clear and in front of the misty clouds in your present sky. If you use the standard 'Altas Full Moon' from the night time skies library, you get a clear dark blue sky with stars (and a full moon). If you then set the Bryce Moon to be in the position you want it (in front of your Moon), it will light the scene up for you as if the Moon light is coming from the back. You can then add some fill lights if there are any parts you need to highlight in your scene. Good start. Righto, the Moon is farther away than the clouds so it must be behind them. Hate to be a 'stickler' on this, but, as previously posted in another thread, if you're going to represent the Moon from an earth-based perspective, then you have to have the correct oreintation. 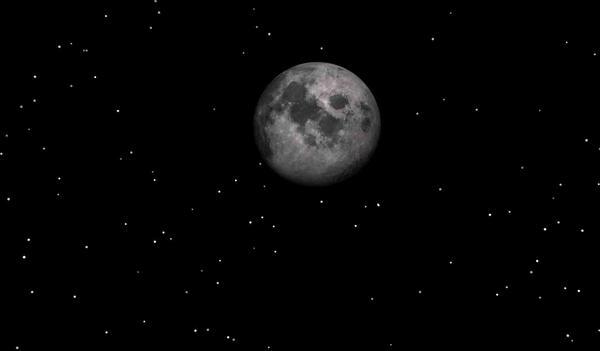 Right now, your Moon is reversed - east/west wise. Below is how we see it from Earth (from someone viewing it from a northern hemisphere, that is). Hope this helps? But that said, everyone is free to represent their renders in any way they choose. Right now, your Moon is reversed - east/west wise. Yeah, a photograph made with a telescope - Newton or (Schmidt-) Cassagrain, not one made with a tele-lens on a camera. Yep! For a northern hemispheric viewer, the NATURAL view (orientation) of the Moon in the eye of an observer at said location is as in my last comment above. Telescopic-wise, all views of the Moon though such instruments (on this hemisphere) will have this orientation come through the primary lens, and then adjusted afterwise in the various secondary lenses, or 'correctors' - mirrors, right-angled prism, lenses...etc. @shaykall: Look at the moon's position and then the direction of the light. In your render the light appears to be coming from left to right, the back side of the lower mound is shadowed. 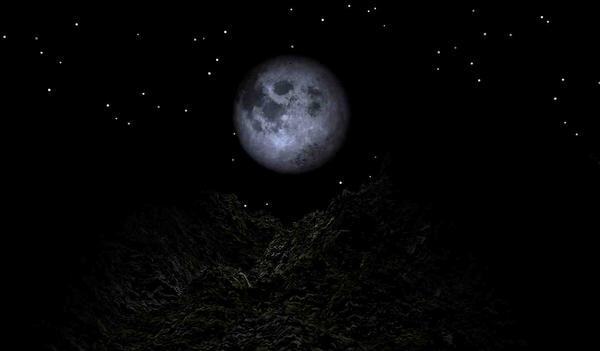 If the moon was actually in the rendered position, the light from the moon would be coming through between the small mound and large hill. And you'd see light on the left portion of the water; and depending on the orientation of the large hill, shadow somewhat on it as well. Granted, with a full moon there would be low general lighting, but with obstructions it would be less. I will reverse the image in a graphics programme, being an ex pom I cannot remember how it looked in the northern hemisphere. I never gave it a thought that the moon was in front of the clouds duh! will fix that straight away.. I am struggling with the lighting at the moment so will leave that till last. I will have to go through all of the lighting tutorials I have to get my head around it, everything I do with the lights at the moment is hit and miss. Also I need to work a little more on the terrain its just not quite right.. But thanks again guys, constructive criticism is always welcome, gives me a focus point to work on and learn from.. I know what you mean, my main problem is, needing to know the nitty gritty of things, for example if I am watching a tutorial and following along and the instructor says do this and do that, I want to know why I do it and the result if I do it wrong, I find that I learn quicker that way. It takes me longer to learn just by doing it and then trying to fix the mistakes, also remembering what each item / process does. Oh no, no. I don't remember everything. I started making tutorials and put them on my website years ago so I know where to look. A sheet of paper would be lost too soon. Doing the videos takes a lot of preparation on my side and yet I make a lots and lots of mistakes during recording. Between half and a third is left after editing. And I have to resort to the videos now and then to find why something I think remembering doesn't work. Using a 2d image to produce moon renders works fine, however, another option would be to overlay a global cylindrical projected moon map onto a Byrce sphere. The advantage in doing so allows phases to be naturally presented in lieu with the sun’s position (along with the natural lighting conditions, too) in Bryce. Below, some images that are self explanatory, and a look at the different orientations for both northern and southern hemisphere (it can get very confusing, as I'm so used to viewing the Moon as a 'northerner'). 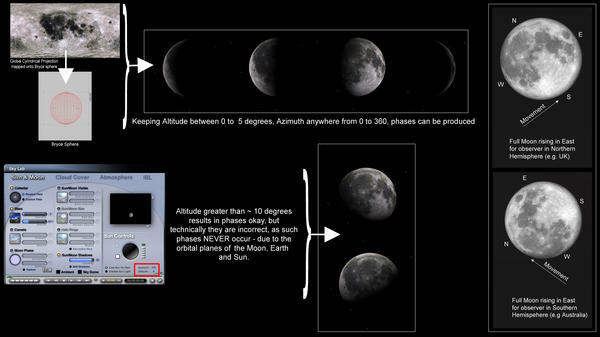 As mentioned in another thread, there is bias in using the northern hemisphere view of the Moon in the general media over the southern hemisphere view, and this option can get contentious at times as to which should be used. If interested, a global cylindrical projection of the Moon by Jens Meyer can be found here (big image 4096 X 8192) –> http://laps.noaa.gov/albers/sos/moon/moon_8k_color_brim16.jpg, which you can then overlay on to a Bryce sphere. Thanks for this, this is my result, I know its not the right view, just pleased with myself that I managed to map the moon. Using a 2d image to produce moon renders works fine, however, another option would be to overlay a global cylindrical projected moon map onto a Byrce sphere. Why cylindrical projection and not spherical? Thank You, here is my latest attempt. but I have to buckle down and learn about lighting, I am really struggling, and not quite achieving what I envision. Certainly much much better mapping this onto a sphere for outer space renders. @ shaykall: You and I aren't related, are we? What you've described is the same thing I go through. I can follow a tutorial, usually get the same results, usually, but when striking out on my own I end up watching the tutorial again. Starting Bryce is the easy part. Doing it myself is another question. The DTE is so complex you could never learn it by yourself for a start.